(L) 40 cm x (W) 27 cm. (L) 15" x (W) 10". 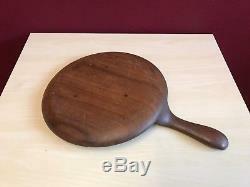 Stamped "Kay Bojesen Denmark Teak". Patina including small scratches, marks. Kay Bojesen considered himself a craftsman, not a designer. His things werent supposed to be drawn. They were shaped in order to work and perform, to hold and to last. Kay knew that utilities were born from demand, not aesthetic reflections. Kay Bojesen was born in 1886 and grew up in a creative home. His father was Ernst Bojesen, co-founder of the publishing house Det Nordiske Forlag, which later became known as Gyldendal. Young Kay started his training in a grocery store, but as luck has it, he was offered an apprenticeship at Georg Jensens newly established silversmith. The time called for Art Nouveau rules with hammered surfaces, but Kays eye for form and function made him responsive to new currents. Kay Bojesen became a great advocate of functionalism, and he was fascinated by the clean, smooth surfaces of the silver, where the material and its reflections were decoration in itself. In 1938, Kay Bojesen presented the ultimate cutlery series in silver, crafted out of the belief that cutlery was a tool that shouldnt steal the picture at a table setting. All pieces of cutlery were crafted with soft and harmonious shapes in order to fit the human hand and mouth. In 1951, Kays silverware took the first prize at the world exhibition in Milan, and was therefore named Grand Prix. In 1952, Kay Bojesen was appointed Purveyor to His Majesty the King of Denmark for long and regular trade with the Court. But not just crowned heads feast on Grand Prix. The cutlery is used to set the tables in Danish Embassy residences around the world, and therefore pride itself with the rare title Embassy-Cutlery. Kay Bojesen was innovative and mastered besides silver, steel, and wood also materials such as bamboo, melamine, porcelain, and tin. In the last part of his career, Kay had his workshop in the backroom of Bredgade 47 in Copenhagen, at his best in a white coat and with Mrs. Erna Bojesen at the cash register. The assortment was a jumble of polished silverware, monkeys, rocking horses and royal guards, bamboo prams and Finn Juhls teak bowls, spun at Magnus Monsens carpentry shop across the street. Kay Bojesens famous design icon, the monkey, saw the light of day in 1951. Kay Bojesen was asked to make a coat hanger for an exhibition of childrens furniture. The long arms bring the hanger down to a reachable height, and the short legs leave room for cap and scarf. Dont be timid, Kay Bojesen said of the creative process. Theres got to be a bit of circus in it. If you are interested in the monkey and other wooden animals of Kay Bojesen, please visit kaybojesen-denmark. Kay Bojesen was constantly rethinking his craftsmanship. He transgressed with the norms of his own time and was a pioneer of what we today know as Danish Design. Kay was rethinking shapes, materials, and the use of objects, and he managed to put more than 2000 objects into production in his career. Despite that Kay Bojesen passed away many years ago, his designs are still dearly loved and stand as iconic symbols of Danish design. Kay Bojesens youngest grandchild, Sus Bojesen Rosenqvist, was born in 1963 and has had a natural interest in her grandfathers craftsmanship from an early age. As a young girl, Sus worked in her grandfathers shop in Bredgade 47 in Copenhagen, and later on, Sus helped her father, Otto Bojesen, with the quality control of Kay Bojesens wooden animals and steel. When the Grand Prix cutlery was taken off the market in 2009, Sus Bojesen Rosenqvist decided to return to the design universe of Kay Bojesen. In 2011, Sus founded the company Kay Bojesen and relaunched her grandfathers silver and Grand Prix cutlery in matte and polished steel. 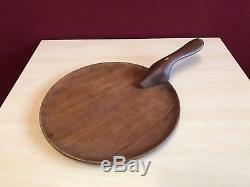 A Vintage Danish Teak Serving Tray by Kay Bojesen. For your security we only despatch your order to the address you provide us at checkout. Any product that has been unsealed (please check regionality before purchasing /opening) will not be suitable for return unless deemed faulty. Return posting costs will be at your expense unless the item is deemed faulty. The item "A Vintage Danish Teak Serving Tray by Kay Bojesen" is in sale since Monday, January 29, 2018. This item is in the category "Collectables\Kitchenalia\Serving Trays".store" and is located in Birmingham, West Midlands. This item can be shipped to United Kingdom, Austria, Belgium, Bulgaria, Croatia, Cyprus, Czech republic, Denmark, Estonia, Finland, France, Germany, Greece, Hungary, Ireland, Italy, Latvia, Lithuania, Luxembourg, Malta, Netherlands, Poland, Portugal, Romania, Slovakia, Slovenia, Spain, Sweden, Australia, United States, Russian federation, Canada, Brazil, Japan, New Zealand, Israel, Hong Kong, Indonesia, Malaysia, Singapore, South Korea, Switzerland, United arab emirates.